"Sarbazan" The Soldirs from csiarts on Vimeo. Mast-e Mastam from csiarts on Vimeo. In his latest America tour, Homay surprised everyone again not only with his expected beautiful and controversial "Chameh Saraii," but with his audacity and boldness in performing two songs in English and Spanish. 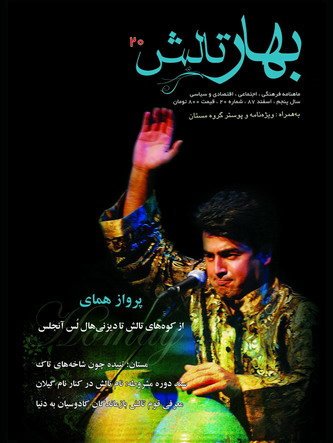 Although he explained that his main intention was and is to take Persian music beyond its Persian boundaries, by taking it to a broader international audience, some of his Persian audience especially those of the older generation, had some objections to this, as they called it, "unfitted" nontraditional act. On the other hand, the younger Persian audience and all non Persian audience loved the songs and all admired Homay's incredible effort in performing these two song, even though some of the words in English and Spanish could not be understood. Here is one of the two songs, the famous Spanish song "Besame Mucho," which was written in 1940 by Mexican songwriter Consuelo Velázquez. Homay has also Persianized and adopted the song by adding his own lyrics in Persian, which is not necessarily matching the original Spanish lyrics. Perhaps, every famous singer in the world has sung this song from it's early years of conception until now, including Andrea Bucheli. This Persian version has been beautifully arranged by Ali Pajooheshgar, the Barbat (Uod) player. One can clearly see that he is enjoying this song more than anyone else. And now, here is Homay's version, which, in the opinion of this writer, if not better than some, it is equal to many of the existing versions. Here is also the original Spanish lyrics and the English translation of the original "Besame Mucho"
Bésame, bésame mucho, Como si fuera esta noche la última vez. Bésame, bésame mucho, Que tengo miedo tenerte y perderte después. Quiero tenerte muy cerca, Mirarme en tus ojos, verte junto a mí. Piensa que tal vez mañana Yo ya estaré lejos, muy lejos de tí. Bésame, bésame mucho, Como si fuera esta noche la última vez. Bésame, bésame mucho, Que tengo miedo tenerte y perderte después. Kiss me, give me many kisses, As if tonight were the last time. Kiss me, give me many kisses, Because I 'm afraid of having you then losing you. I want to have you very close, To see myself in your eyes, to see you next to me. Think that maybe tomorrow I'll be far, far away from you. Kiss me, give me many kisses, As if tonight were the last time. Kiss me, give me many kisses, Because I 'm afraid of having you then losing you. 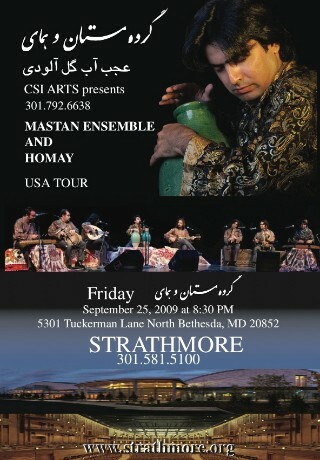 "Besame Mucho" by Homay and the Mastan group of Iran from csiarts on Vimeo. You ! Who live like a King now, remember the ending of "The Shahnameh"
The back of Tyrants will ALWAYS be put to the ground ! Stop killing your conscience ! The innocent sighs of heartbroken Mothers. Perhaps this song by now has become a logo or a theme song for Homay and the Mastan Group. But this version is truly remarkable and exiting as a National Anthem can be. It was performed at Walt Disney Concert Hall in Los Angeles, CA on August 16, 2009. Homay and the Mastan Group will be in the US and Canada for their North American tour of 2010, starting August 15 from Walt Disney Hall again. The Washington DC concert will be on September 19, 2010 at the Music Center at Strathmore again. .On August 16, 2009, Homay brought his operetta , "Moses and The Shepherd," at The Walt Disney Hall in LA. The story has been adapted from A. M. Bakhtiari's "The Mystery of The Mystics." Music, Lyrics, and design were all by Homay based on three characters, Moses, The Shepherd, and The Story teller in 16 scenes. The Music was performed by the Los Angeles philharmonic orchestra mixed with Persian instrument with Shahrdad Rohani as the conductor. Homay was the shepherd, Ms. Homa Sarshar was the story teller, and another Persian (pre-revolution) singer, Soli, played the role of Moses. This was the first time that an Iranian Opera being performed at one of the biggest concert halls in the world. The second part of the concert (only at Disney Hall) consisted of Homay's new love songs that he performed with L.A. Philharmonic orchestra under the direction of Mr. Rohani. In all existing versions of the story, it ends when Moses coming down from the mountain to bring God's message to the shepherd that God loves shepherd's prayers in any shape or language but Homay, here, has changed the ending with the shepherd's response to Moses. Homay is hoping that one day he can perform this opera in Iran. Although, this opera has been performed only for L.A., he has received other invitation from other promoters from NY, Washington, London, and Paris to perform it there too. Homay and the Mastan group, performed their new program called "What a Muddy Water" in their grand tour in the US and Canada. Homay believes it is such a big honor for him to be working with Shardad Rohai. The moment you put me in the grave drunk, hide a jar of wine under my shroud too. So I can drink of this wine on my my to "hell"
So at the moment I meet with other residents of "ell" (DOOZAKHIAN), I would have a jar of wine for them as a gift. As much as I could not drink of this clear wine on Earth, I can make it up when I am sitting down with "Doozakhian." since I am burning in the fire of 'LOVE" like "HOMAY,"
Shahrdad Rohani(Persian: شهرداد روحانی) is an Iranian composer, violinist/pianist, and conductor. His style is contemporary (sometimes even New Age), especially when compared with his mentors/inspirations, Anoushiravan Rohani and Javad Maroufi. He is probably most known for arranging and conducting the Yanni Live at the Acropolis concert, an open-air concert with the London Royal Philharmonic Concert Orchestra in the Parthenon, Athens, Greece. This concert was acclaimed by both critics and audience and became the most widely viewed program ever shown on Public Television in United States and is the second best-selling music video of all time. Having been educated since childhood at very prestigious schools has made him into a grand maestro, winning awards in various countries and composing in varied styles. He studied at the Academy and Conservatories of Music in Vienna, Austria, and received several important scholarships and awards both in Europe and United States. These include the A.K.M Scholarship, Vienna, Austria, and the ASCAP Scholarship, Los Angeles, California. Mr. Rohani is the music director and conductor of the COTA symphony orchestra in Los Angeles. He has appeared as a guest conductor with a number of prestigious orchestras including, the London Royal Philharmonic concert orchestra, Minnesota Symphony orchestra, Colorado Symphony, San Diego symphony, Indianapolis Symphony, New Jersey Symphony, Zagreb Philharmonic and the American Youth Symphony and others. In December 1998 Mr. Rohani was commissioned by the government of Thailand and the committee of the 13th Asian Olympic Games to compose and conduct the music for opening ceremonies. The composition became the most popular song of the Asian Games. Mr. Rohani has recorded several classical CDs with the Slovak Radio Symphony orchestra for Discover/Koch International including the Tchaikovsky Ballet music which received raging reviews by the media including the Intune Magazine in Japan. In 1999 Mr. Rohani received the Thailand's Pikanes award, the country's most prestigious music award for an outstanding orchestral performance. The award is considered the highest artistic achievement.